As we move past state testing and into the last months of the year, I like to have students work in literature circles. Literature circles are a great way to get kids talking about their books and engaging with text. For my transitional readers, though, the literature circle books I've chosen present some new challenges. In Misty of Chincoteague and Bunnicula, there are exchanges of dialogue in which the speaker is not identified. While I'd like to believe that all of my students have mastered the ability to pick their way through tricky dialogue, I know that this is not the case. To help them work through the dialogue, my student teacher and I tried this simple activity. After talking about ways that we know how different characters are speaking, we gave students a short snippet of a story and directed them to use colored pencils to underline the dialogue of the different characters. What a revealing activity this is! Identifying the speaker in dialogue is, after all, a kind of inference. This inference is text-based--that is, it pulls on the reader's background knowledge of how text works. As I talked with students about their work, I was able to gain some insight into how they thought about text. "How did you know that this was Robert?" I asked one student. "Oh, well," he said. "There were already two people in the kitchen, and then someone else came in. So I pictured him coming in, and then I just knew that he had to be the older brother." Here, I could learn much about how this student was processing the text--he was visualizing the setting, and tracking the movements of the characters. These are the skills he needs to be successful with understanding a story. But I learned about problems as well. One student underlined the entire first five lines. "But, ___, why did you underline so much? There are no quotation marks," I asked, a little puzzled. He answered, "Because she's the one who's telling the story, right? So she's talking." Oh! In this case, the student had mistaken the narration of the first-person narrator for dialogue. Think about how this changes his perception of the time of the story and how it unfolds. I grabbed a new copy of the page and tried to explain. "She's the one telling the story, yes. But it's not the same as dialogue. Look, the dialogue is down here--see, with the quotation marks? That's how we know that different people are speaking." He dutifully took the colored pencil and underlined where I had shown him. But I could tell that he still wasn't convinced. And I was falling down the rabbit-hill of teacher-thinking: trying to figure out how he was building his mental model of the story, and how the time of the first-person narrator was different from the story-time, and how perhaps I should have used a third-person text for this activity, but that maybe it was better to have a first-person text, because now I knew this was a problem, and how this would impact teaching the writing of first person narratives, and maybe this was why some kids were so resistant to adding dialogue to those narratives--because they thought they were already using dialogue. Lots to think about there! And that, to me, is the hallmark of a great classroom activity--situations like this that get me thinking about all of those spaces between what we think we teach and what kids are actually thinking and learning. 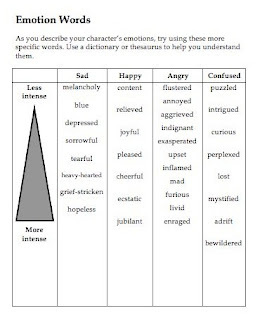 As I work with students on summarizing, character traits, and character emotions, I try to convince them to use more specific, detailed words. Many of the words that work particularly well in fiction are not in our everyday speaking vocabularies. It can be a challenge to help students to learn and assimilate these words. One of the best tools that I've found is a list of related words for a specific purpose. I give students the list, often on brightly colored paper so that it stands out in their reading folders. Instead of going over the words one by one, I present them with situations that might encourage them to try one of the new words. For example, with character emotions, I give students this list (originally published in The Forest and the Trees). Then, we act out various situations and talk about which words would fit the situation. Curious kids will ask--"What is the difference between perplexed and bewildered?" Once they've asked the question, it's the perfect opportunity to help them understand the meanings and uses of these words. The list of words for summarizing dialogue works in the same way. After I gave out the list, I had students act out simple situations that lend themselves to the words on the list. We talked about how we could summarize the long conversations into just one or two sentences using these words. Once again, including known words with the new words helps students to figure out the shades of meaning and how these words relate to each other. What else could you use lists of related words to teach? I think there are many possibilities! Next year, I'm going to pull this over to math class to help students describe their mathematical thinking. As I wrote last week, we're in the final stretch of test prep, and so we are brushing up on story elements and fiction summarizing. The students did a nice job of summarizing the story "The Goose in the Blackberry Patch". However, they had some trouble with the story "The Mystery Eggs". Why? The stories are both fairly short. On the surface, they seem to be somewhat similar. However, it didn't take me long to realize the problem--"The Mystery Eggs" contains much more dialogue. 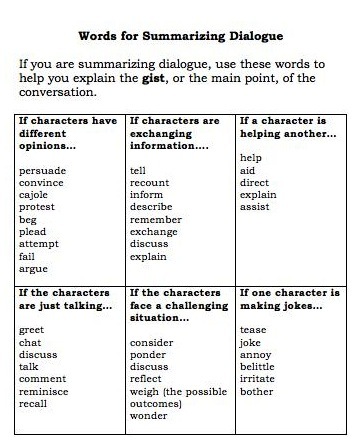 And it is the dialogue that's so tricky for students to summarize. Many of my capable readers wanted so earnestly to provide a faithful accounting of the events that they tried to explain the characters' conversation. It sounded something like this--"Melanie said the eggs were bird eggs, and Clara said no they are not." Some of them ran out of room before they were able to explain all of the events and tell how the problem was solved. What to do next? For testing, I am not too concerned...as long as students get the key events (and most did), they should be fine. But I now have a wonderful direction for instruction once testing is over. We had already planned to begin literature circles. I'm going to continue to work on summarizing that tricky dialogue. 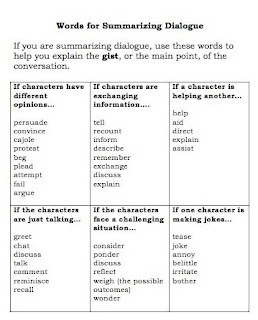 I've created a list of words to use for summarizing dialogue, and some practice activities. As students read their literature circle novels, they'll try to find pages that are heavy in dialogue, and summarize those pages. You can find the story "The Mystery Eggs" here, under the Grade 4 Reading Sampler for 2008-2009. It's a really fun one that kids always like, despite the fact that I use it for test prep. Here is a Powerpoint that I wrote a few years ago to help students learn how to summarize a narrative. It introduces students to the bad strategies that they may have picked up, explains the characteristics of a good summary, and then has them choose the best summary to the story "The Very Hungry Caterpillar". Why this really simple book? Not only is it widely available and easy to track down in just about any school, but it has lists to collapse and is a quick, engaging read. As I prepare for state testing this week, this presentation will be a nice review. Then, students will practice summarizing with the story "Goose in the Blackberry Patch" from our state's released sampler items. You can find Pennsylvania's testing samplers here. Many of the stories and nonfiction pieces are nicely written and can be useful in the classroom even beyond test prep. "Goose in the Blackberry Patch" can be found in the grade 4 2005-2006 reading sampler. When teaching poetry, it's often easy to just break it down into small bits. This bit is personification, this bit is alliteration, this bit is a simile. But poetry is more than these small bits. Instead, readers need to try to figure out what the author is saying. This process requires a reader to make multiple inferences--sometimes in very few lines of text. Teaching poetry goes hand in hand with teaching inferences. Readers need to use their background knowledge to reach for the meaning of the poem. While the figurative language is important, it's only a piece of the puzzle. Where to find good poetry for kids? I've had tremendous luck at discount bookstores, like the ones that you find at outlet malls or vacation spots. I have also had luck with combing the shelves of used book sales at libraries. These two sources have opened my eyes to some great books of poetry that I may not have otherwise found. (Plus, they're often inexpensive!) Here are some of my favorites--and the ones that I've picked up for my classroom are all from discount or secondhand sources. While you may not be able to buy them directly anymore, you may still be able to get them from libraries. Amber Was Brave, Essie Was Smart: This is a story told in poems. I love the title poem for teaching character traits. Author Vera B. Williams tells us these traits right off the bat, and then supports them with specific details. Throughout the rest of the book, the story of the sisters and their situation unfolds. The copy that I picked up had a different cover, so I think there may still be older editions floating around that you can get for cheap! Once Around the Sun: This book goes through the year with a poem for every month. The poems are filled with personification, alliteration, and similes...but even better, the poems are about kid-friendly, concrete topics. The colors of the illustrations evoke the feelings of the seasons. The poems are wonderful for helping students to see how they can take a poem apart to find the different kinds of figurative language, but put it back together to look for a main idea. Definitely a must for your classroom library. 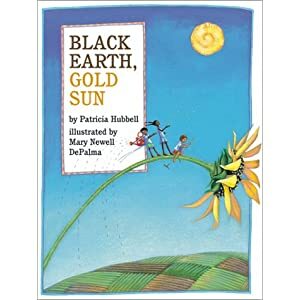 Black Earth, Gold Sun: I love gardening, and this book of gardening poetry is one of my favorites. I bought it as a discard from a library. Just today I read the first poem with a previewing group, looking at how the author uses a simile to compare the freshly dug earth to a chocolate cake. (What an image!) The poems have nice specific vocabulary words to stretch the students' understandings, with supportive pictures help them to put the pieces together. Hey, You! Poems to Skyscrapers, Mosquitoes, and Other Fun Things: I bought several copies of this over the weekend, and then promptly turned them over to other teachers--so I haven't had much of a chance to explore it much. Hopefully I'll get my copies back. Trailblazers: Poems of Exploration: This book makes a wonderful history connection. Bobbi Katz writes poems from the points of view of various explorers. She chooses a diverse bunch, going beyond the obvious people. Definitely worth looking for, especially if you teach social studies.